Lady Antebellum are possibly the biggest act on the Country music scene, with their incredible sound made up of just three main members, they are a rare gem and a must-see for any fan! 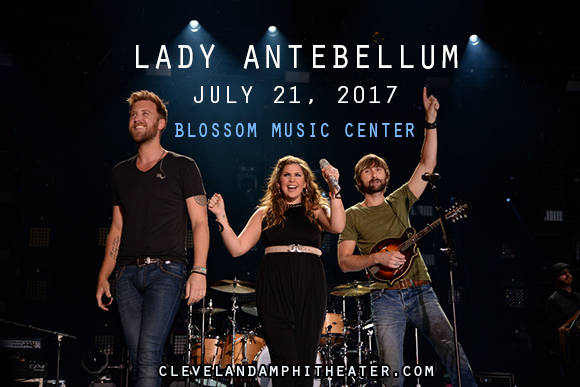 Get ready to catch them LIVE along with special guests Kelsea Ballerini & Brett Young as they hit the Blossom Music Center on Friday 21st July 2017! Tickets are bound to sell out for this one – so get yours quick! "With a decade under their belt as one of the dominant vocal groups in the genre, the trio came to play — and they did just that, giving fans a healthy dose of their hit catalog. They reached back to their beginnings for “Love Don’t Live Here” and “Lookin’ for a Good Time,” with the latter bringing out the playful chemistry between Scott and Kelley. The former also showed her more saucy side with the hit “Bartender” and “Downtown,” both of which hit the right note with Lady A’s devoted legion of female fans, especially."